Wis. Gov. Scott Walker said the GOP legislative leader, who apologized for "stupid comments while under the influence of alcohol," should quit. MADISON, Wis. — Gov. 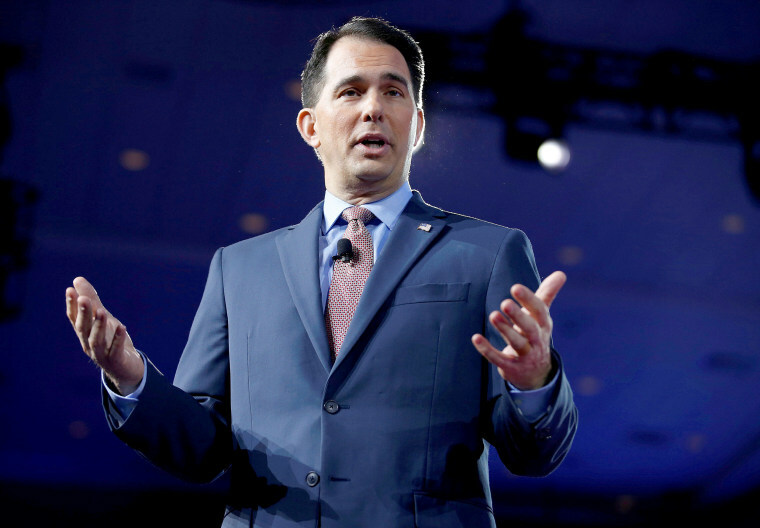 Scott Walker on Wednesday called for a Republican Wisconsin Assembly leader to resign after the lawmaker apologized for making what he called "stupid comments while under the influence of alcohol" to three female legislators. Citing sources it did not name, the Milwaukee Journal Sentinel reported that Assistant Republican Majority Leader Rob Brooks told Rep. Jessie Rodriguez that he was buying drinks for everyone except her because she is Hispanic. She is the only Republican Hispanic member of the state Assembly. The newspaper said Brooks made sexual comments to Reps. Cindi Duchow, R-Delafield, and Amy Loudenbeck, R-Clinton. "Representative Brooks' comments are offensive and disrespectful," Walker tweeted. "They have no place in our society and are inconsistent with the high standards that must be held by those in public office. He should resign from office, period." Brooks did not immediately return a message seeking comment. Brooks said in an earlier statement that he takes responsibility for the comments made following a Republican caucus in Wisconsin Dells this summer. Brooks, of Saukville, was first elected to the Assembly in 2014. He was chosen as assistant majority leader by his Republican colleagues in 2017. Rodriguez, R-Oak Creek, is caucus secretary, another leadership position, and Loudenbeck is a member of the Legislature's powerful budget-writing committee. None of the three lawmakers immediately returned messages for comment. But, in a joint statement issued by Assembly Speaker Robin Vos's office, they called the comments "inappropriate" and "offensive" but did not relay exactly what Brooks said. They said they notified Assembly Chief Clerk Patrick Fuller who discussed it with Brooks. He then apologized, the lawmakers said. The statement from Vos's office said another Republican lawmaker, Rep. Mark Born, became aware of the situation that night and spoke directly to Brooks "about his offensive comments, which then ceased." Born did not return a message. "I regret that I made some stupid comments while under the influence of alcohol after our caucus in the Dells," Brooks said in a statement before Walker called on him to resign. "I take full responsibility for my behavior and have apologized for my actions. I am ready to move on from this incident and fully support and will adhere to the Assembly policies to maintain a safe workplace for legislators and staff." Vos, Assembly Majority Leader Jim Steineke and budget committee co-chair John Nygren did not immediately return messages seeking comment on whether Brooks should resign. The Democrat challenging Brooks for re-election, Chris Rahlf of Cedarburg, denounced his actions. "Sober or drunk, it's not OK to make these kind of remarks," she said. "I'm glad that the women involved are satisfied that the correct course of action was taken. We must keep striving for a society where everyone is respected all the time." The Wisconsin Legislature drew criticism in the fall of 2017 over its policy not to release complaints about sexual harassment or misconduct by legislators or their staffers. Clerks of the Senate and Assembly defended the policy, saying that releasing the records would have a chilling effect on reporting incidents.